Japanese Enoki mushroom (lily mushroom) was considered by ancient Egyptians to bethe mushroom of immortality and reserved only for pharaohs. Today it’s grown around the world and widely used for its high content of active ingredients. 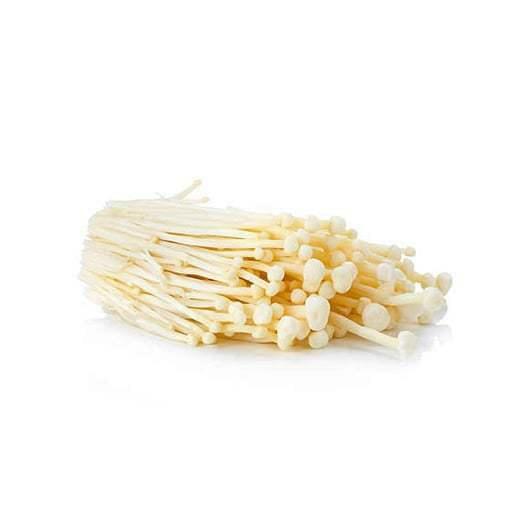 Enoki (lily mushroom, Flammulina velutipes) is a well-known edible mushroom, mostly in China, Korea and Japan. Enoki grows saprophytically in in clusters on tree trunks, near roots or on stumps. In nature, It’s mostly found during colder periods of the year, for example, in autumn and winter. The caps are honey or brown in colour and they’re sticky, while the leg is velvety. Nowadays, the mushroom is grown commercially, in order to cover the demand, which grew in the last century after research byDrIkekawi, who studied the incidence of cancer in the common population and in the population growing and consuming Enoki. In history, Enoki was appreciated by ancient Egyptians and Chinese. In Egypt, it was seen as a mushroom of immortality and so it was reserved only for pharaohs, as well as in China, where it was seen as a mushroom, which prolonged life. Enoki contains a lot of active substances vitamins, minerals, polysaccharides ‒ beta glucans, antioxidant polyphenols and isoflavones, e.g. genistein, adenosine, terpenes, steroids or sphingosine cerebroside, etc. 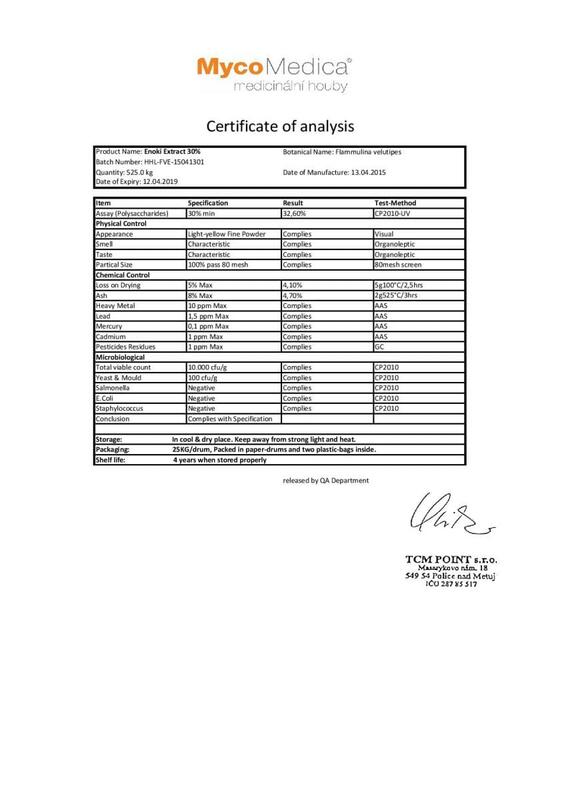 The concentration of polysaccharides in the extract is also important. You can find more information about effects of Enoki at Mushroom Collection or in the section Effects. I learned that the Enoki mushroom can increase the number of immune cells and activate them. Since I have a weakened immune system, especially after winter and after taking antibiotics, I’ve decided to try the Enoki mushroom‘s effects and I‘m very happy to find MycoMedica. Not only do they have good quality products, but they‘re also able to explain and advise me. I can recommend MycoMedica and medicinal mushrooms and I will continue to order them. I’ve been suffering from mite allergies since my childhood. I was looking for a natural supportive product against allergies, and I read about medicinal mushrooms on the Internet. I take Enoki regularly, which should suppress my immune system‘s exaggerated reactions and I am very happy with the result. I am treating breast cancer, a Chinese medicine practitioner explained to me that some medicinal mushrooms are very effective in cancer and that they can trigger apoptosis and strengthen immunity. Because of these effects, I began taking the Enoki mushroom and I don’t have any regrets. I can recommend it. I‘m often sick, so I take 3 Enoki capsules a day, I have to say that I feel that there is real increase in my immunity because I‘m not so sick so often. Mr. Schirlo explained to me that Enoki acts as an anti-inflammatory and it‘s also a powerful antioxidant, protecting the blood vessels and having a beneficial effect on arteriosclerosis. I ordered Enoki for my dad and he is happy with it. Thank you for your great attitude. I use Enoki and Shiitake to strengthen my immune system, I'm happy with the effect and I can recommend it. After reading an article on MycoMedica on brain function enhancement, I decided to try and I take the Enoki mushroom on the basis of the scientific background. If you want to improve your memory, be sure to try. Hello, I currently have Enoki, Reishi, Cordyceps and Auricularia mushroom which are helpful in supporting the cardiovascular system. I also see a number of beneficial side effects, for example, more energy. Overall, I feel better than I did before taking them. I use the Enoki mushroom as a supplement for cancer treatment. I’ve studied its effects and I‘m convinced that it will really help me and I‘m very happy with it. I take the Enoki mushroom, due to weak immunity, and I‘ve also bought it for other family members. We‘re all satisfied, we‘re not ill and cold so often. The therapist recommended that I use the Enoki mushroom along with Reishi for food intolerance. 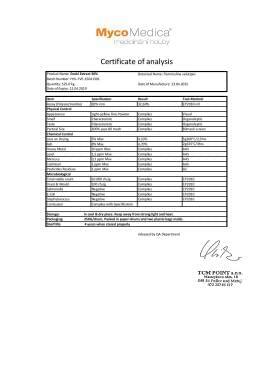 I added the extract from Yi Yi Ren (MycoClean). The children take it too. I can see how my condition is really improving. According to Chinese medicine, I strengthen the spleen by dietetics.